Text adventures like Quarantine Circular, the latest from indie developer Mike Bithell, present a tantalizing future for video games. It presents dialogue as a genuine plaything, a tremendously exciting notion. Sure, we are still a long way from rendering the possibilities of speech in terms of believable simulation, and Quarantine Circular demonstrates the current limitations of the form. But, oh boy, I’m excited about what this game may signal for things to come. 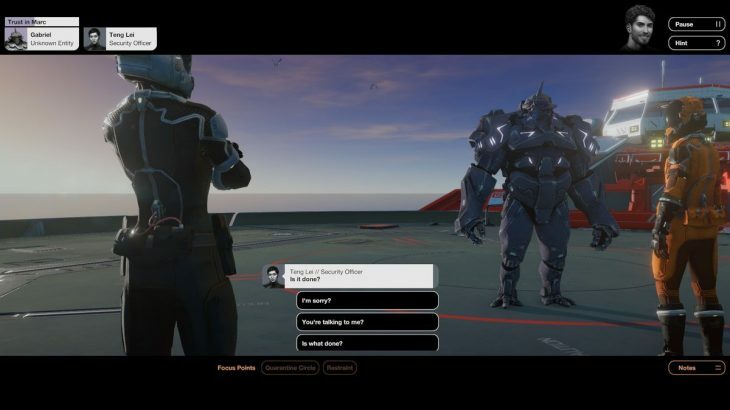 Mike Bithell’s series of short games seeks to push conversational gaming onward, within the testing constraints of tight budgets and limited development time. Like his superb Subsurface Circular, released last year, Quarantine Circular is a series of dialogue trees, peppered with simple puzzles, climaxing in a big moral choice. 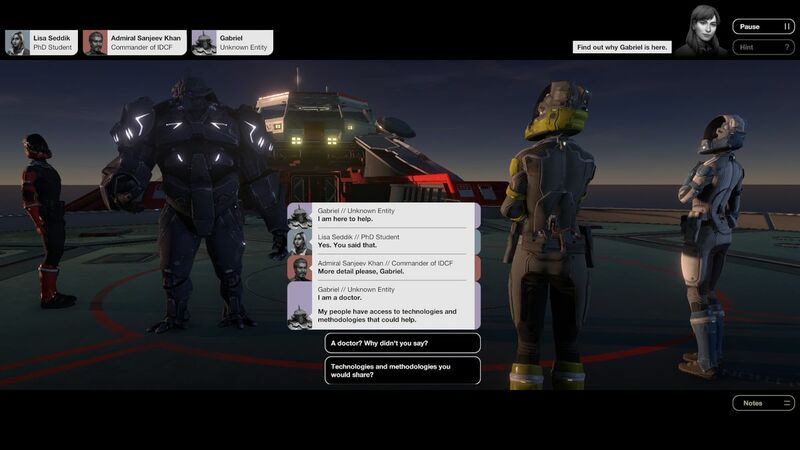 While Subsurface Circular offered two alternate endings, this game has six. I played through three of those endings. Game time for a first playthrough is about 2.5 hours. Art, music, sound effects and settings are kept to a minimum. Rather, as in a good stage play, the direction achieves much with little. For example, we don’t get the emotional range of facial expressions, because all the human characters are in full body suits. This puts a great deal of emphasis on the words. The story is a basic human-meets-alien setup, in which I try to interpret a first contact situation in such a way that will prevent a global extinction event. Translation technology allows the alien to speak to humans. So, right from the start, we’re offered an appealing dialogue fantasy. Who wouldn’t want to speak to the first alien to land on Earth? I take on the roles of different characters — including the alien — working toward specific goals that progress the story. The human cast represents various familiar worldviews, from starry-eyed optimism to cautious centrism to outright paranoia. The plot asks, what does the alien really want? But the game has more weighty questions, about tribalism, trust and the meaning of civilization. I choose from a small selection of dialogue prompts, or I can push the conversation in specific directions, indicated by on-screen buttons. Perhaps I want to prioritize questions about the alien’s home planet over inquiries about their intergalactic propulsion technologies. The conversations follow a limited number of paths. It’s a trick, making use of a kind of narrative magnet that draws the player ever inward, toward the central plot. Choices are often presented between a commonsensical option and one that seems ludicrous. Both bring me back to pretty much the same place. Good and bad options turn out to be conveniently similar in outcome. These games aren’t big enough to embrace willow tree dialogue options that spread out languidly. These trees are more perpendicular and fir-like. Quarantine Circular is entirely relaxed about how I proceed, seemingly happy for me to click on everything until I get to the desired destination. I find myself yearning slightly for a sense of the impending dreadful mistake, a moment of genuine peril. If the game is merely a matter of betting on all horses, then its ability to excite is limited. Once again, this is a result of a format with severe practical constraints. There are a few points of narrative diversion, leading off to those six endings, but they mainly appear at the end. It feels a bit like taking a train to a terminus, disembarking and then choosing which cab to take. Even so, the trick just about works, mostly because the writing is excellent, and because the story encourages a suspension of disbelief that allows me to forgive the conversation technology’s limitations. Playing Quarantine Circular, I feel like I’m at the edge of dialogue as a core video game mechanic, while at the same time, being at the center of a bloody good yarn. Bithell delivers a strong story with powerful archetypes. His dialogue is dotted with good jokes and compelling ideas. Perhaps best of all, he knows when it’s time to get off the stage. There are some failings. The decision to jump between characters weakens the emotional power of the game’s central problem. Experimentation is all fine, but the rules of narrative are difficult to escape entirely. Multiple endings also, weirdly, constrict the writer’s ability to construct a confounding denouement. The endings I experienced were all pretty much as I expected, given the story. I’d like to have been shocked or surprised a little more. Perhaps I’m being unfair, and there are some zingers in the endings I did not experience. Dialogue games have a long way to go before they can offer the sort of fidelity and substance we’ve come to expect from, say, graphic action games. It’s a way more complicated problem to simulate talking to an alien than it is to simulate shooting one. The same goes for humans. Quarantine Circular is a useful reminder that this genre can entertain us in the here and now, while straining toward a more thrilling tomorrow. I’d like to live in a world where games in which I mainly converse are a major form of entertainment. Perhaps we should call them “talkies.” How amazing it will be when we can play-chat with complex avatars, whether they are creatures from alien worlds or figures from human history. How cool to flirt with Socrates or banter with Queen Elizabeth II. Mike Bithell and his team are doing important work, struggling with a challenging genre. Quarantine Circular hasn’t perfected it, but if you like stories, characters, dialogue and moral choices, it’s worth one playthrough — or maybe even six. 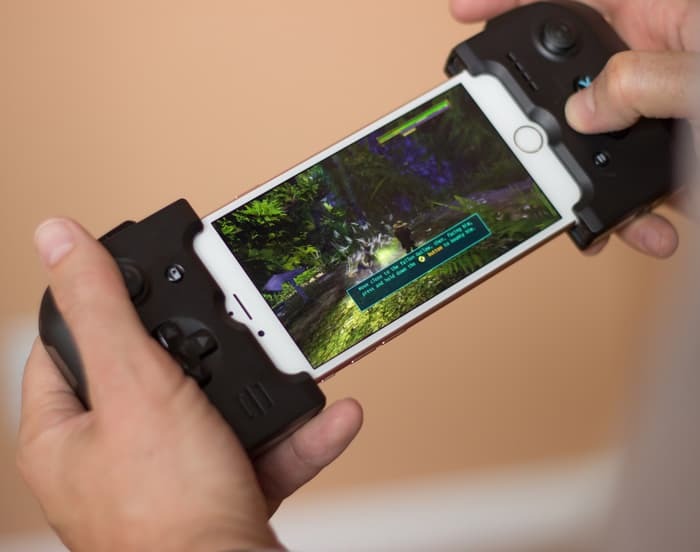 Quarantine Circular was played using a final “retail” Steam download code provided by Bithell Games. You can find additional information about Polygon’s ethics policy here.